The Rheem Prestige™ Series Modulating R97V Gas Furnace was designed using our 360°+1 process, which means every detail of the product is meticulously evaluated from every angle. We consider the work that goes into installing and servicing our products, as well as how we can deliver the very best homeowner experience. And then we take it a step further. That’s 360°+1. And that’s why you can count on your gas furnace to bring you and your family years of comfort. Modulating operation saves energy and maintains optimal comfort level during every season. Maximum Efficiency A 97% Annual Fuel Utilization Efficiency (AFUE) guarantees this gas furnace makes the most of every drop of fuel. Our Prestige Series Gas Furnace is designed with the exclusive Plus One™ Ignition System – which is nine times more reliable than other commonly used igniters. EcoNet This innovative technology sends you important alerts and reminders to keep your system working at its best. Plus, it’s easy to adjust your comfort settings from home or away. Enjoy warm, cozy winter nights with a reliable Rheem Gas Furnace. Rheem offers products that fit every budget, so your family can enjoy reliable home comfort for years to come. We focus on bringing homeowners ‘The New Degree of Comfort’ through the development of energy-efficient Heating and Cooling solutions designed to save money and go easier on the environment. With a Rheem Gas Furnace, you’ll enjoy a perfect balance of comfort, efficiency and reliability ,The Rheem R95T Classic Plus™ Series Gas Furnace offers a more reliable way to keep your home just the way you like it. It’s designed for energy-efficient comfort that will save you money and give you peace of mind. 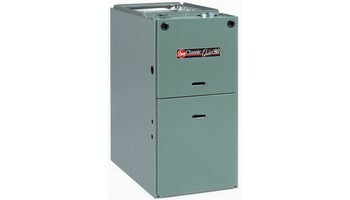 You won’t have to give your new gas furnace a second thought. The Rheem Classic Plus™ Series Gas Furnace was designed with industry-exclusive features for years of worry-free comfort. It’s also quiet, so you can stay focused on what matters most. Our gas furnace line was already recognized as best in its class**, but that didn’t stop us from making it better. We designed our new Classic Plus™ Series Gas Furnace to provide your home with reliable, easy-to-maintain and quiet comfort for years to come. Reliability is essential to your home comfort. That’s why we’ve engineered our gas furnace with the PlusOne Ignition System. Our Direct Spark Ignition is a Rheem -exclusive feature that’s nine times more reliable than most hot surface igniters. It’s also the same proven design used in commercial HVAC equipment and gas home appliances. Our patented heat exchanger is quick and easy to clean – when needed – by your local independent Rheem Dealer. And a clean furnace is a long-running furnace. Enjoy greater comfort and performance thanks to a two-stage operation that offers a more consistent indoor environment – keeping cold spots to a minimum. The two-stage heating design primarily operates on low speed, only temporarily switching to high during peak cold-weather conditions. The R802P also delivers 80% AFUE, which means 80% of the fuel in your furnace is converted to heat. Fast and accurate diagnostics are a big benefit to both you and your Dealer. The Rheem Classic Plus™ Series Gas Furnace features Plus One Diagnostics, our industry-first 7-segment alphanumeric LED display that simplifies troubleshooting. Just in case there’s a need, service calls are faster, which ultimately saves you money. Hassle-free installation saves you and your Dealer time and trouble. The 34" cabinet fits nicely in tight spaces allowing for both new construction and retrofit installations. The Rheem RGGE, RGFG, and RGJF Prestige Series™ 90 Plus Communicating Modulating gas furnaces equipped with the Comfort Control² System & Contour Comfort Control line of Upflow/Horizontal, & Dedicated Downflow, are designed for installation in closets, alcoves, utility rooms, or attics. The design is certified by CSA International.Provides advanced service-ability with over 28 on-board diagnostics & fault history codes by detecting system & electrical problems. “Call for Service” alert notification is sent to the thermostat to alert the homeowner of required service. This includes dual seven segments LED & diagnostic history for easier system diagnostics & troubleshooting.When installed with a Serial Communicating Condensing Unit & user interface control RHCTST550CMMS)500 Series thermostat this unit offers 4 or 2 wire installation, auto-configuration, & diagnostic messaging with full communicating capability.Energy efficient & quiet ECM 3.0 communicating motor. An insulated blower compartment, a slow-open gas valve, specially designed 2-speed induced draft motor & blower motor make it one of the most reliable & quietest furnaces on the market today.When used with a modulating thermostat, modulation rate between 40% and 100% of total capacity. When used with a two-stage thermostat, furnace operates at 40% on first stage, & stages up to 65%, then 100% for second stage.